Homeowners are always looking for ways to make their homes more efficient and save on energy bills. A lesser-known feature of your thermostat may help you do just that. Do you know about your thermostat’s temperature differential? If not, read on to learn how this feature can help you save on bills while keeping your home cozy and comfortable. NOTE: This article is not about the temperature differential between the outside and inside temperature and how that affects your HVAC efficiency. For information on that topic, visit our article entitled What is the Temperature Differential and How Do I Use It? What is a Thermostat's Temperature Differential? All thermostats are pre-set with a temperature differential or gap. It’s the temperature difference between when your heating or air conditioning kicks in and when it shuts off. For example, if you set your cooling temp at 80 degrees Fahrenheit, your thermostat may actually activate cooling at 83 degrees and shut it off when the temp reaches 80 degrees. That’s a differential of 3 degrees Fahrenheit. It’s easy to confuse a pre-set temperature differential with the temperature changes available on a programmable thermostat. But they’re not the same thing. A programmable thermostat lets you manually set temperatures based on specific days or times of days. The pre-set temperature differential of your thermostat would still apply to your manually-set temps. How Does Temperature Differential Affect Efficiency? The larger the differential, the longer it will take your AC or furnace to cool or heat your home to your selected temperature. It will also take longer for that temp to rise or fall to the point where your system kicks back in again. If the differential is too high, some furnaces may kick into “high-fire” setting, which is less fuel efficient than “low-fire.” (Many conventional furnaces have two “firing” settings that adjust for faster heating. However, the higher efficiency furnaces won’t typically make this adjustment unless they’re reading extremely cold outdoor temps.) Air conditioners work similarly, running at higher or lower cooling power based on cooling needs. If the need is low, the compressor slows down and operates at a more efficient level, saving on energy. So, while too high a differential may actually increase your energy usage, one that is too low can also be a problem. A low differential can cause short cycling, where your furnace or AC kicks in for short periods, shuts off, and kicks in again soon after. This can negatively affect your system’s efficiency and cause unnecessary wear and tear on its parts. We recommend settings that provide 3 to 4 CPH (cycles per hour) for the best of both worlds – high level of comfort without rapid cycling the equipment. Many thermostat temperature differentials are set using a CPH adjustment. The on-time and off-time will change as the outdoor temperature changes, but the total cycle time should be roughly the same. (i.e. in mild weather, a 2 minute heat time followed by 8 minutes off is also a 10 minute cycle or 6 CPH). No single differential is the best. There are just too many factors involved, including the HVAC system itself, the thermostat, the outdoor temps, and your personal heating and cooling needs. However, most thermostats will be pre-set at a 1-, 2-, or 3-degree differential. Newer, smart thermostats paired with a smart, high-efficiency HVAC system are likely to be set at the 1-degree differential. Older systems are more likely to be set at higher differentials. Can I Change My Differential? That will depend on the model of your thermostat. 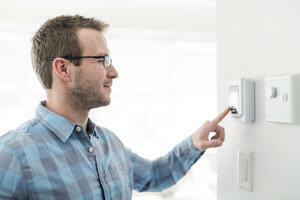 Most manual (non-programmable) thermostats have a pre-set differential that you cannot change. When it comes to programmable thermostats, some allow the differential to be changed, others don’t. You’ll need to check your owner’s manual to determine what your specific model allows. But, if you suspect that your system is either short cycling or unnecessarily kicking into high gear for your cooling or heating needs, it may be time to have your system checked out by an HVAC pro. They can assess how efficiently your system is running and if changing your differential — or even replacing your thermostat — would be a good move.